Participez le 30 Mars prochain aux Kilomètres des Couleurs ! Où ? Au nouveau Club Harmony Fitness & Spa de Veyrier (GE). Créez votre équipe d’entreprise, d’amis, d’élèves ou de famille et parcourez le plus de km. Dépassez-vous en vous amusant pour soutenir un projet genevois ! Inscrivez-vous dès maintenant, fédérez vos collaborateurs, famille, élèves et amis et réservez déjà votre horaire selon vos choix d’activités en équipe. Since two weeks, seven artists have invested the hallways and waiting rooms of the pediatric ENT Unit. Soon some photos and the inauguration! During the 2018 “Course de l'Escalade”, the Colour Team raised CHF 13,000 ! A big thank you to all participants. This money will help finance a project for the HUG pediatric orthopedic ward in Geneva. 13th edition of the Couleurs Team! Register for the 2018 Course de l’Escalade at www.escalade.ch, and join the Colours Team to support a Paint a Smile project! > Registration form here. Whether you are a walker or a runner, you can make a difference by supporting the décor project in the paediatric ward of Geneva’s “Cité Génération” healthcare centre. Once you have received confirmation of your registration, please send us the application form below. Our team will welcome you on the evening of Friday, December 1st and all day on Saturday, December 2nd in the restaurant of the Parc des Bastions where you will find a snack, a place to put your things, warmth and good spirits! A "Paint a Smile" armband will be given to you before your departure. As part of a solidarity day offered to all employees of the Gilead Laboratory, we had the pleasure of welcoming employees who decided to participate in the creation of a decor at the Margency Children's Hospital in the "Sun Room", a meeting place for hospitalized children and their families. This garden-themed decor was created with the help of a team of artists from the Foundation: Dorothée, Lou and Vincent. Thank you to Gilead Laboratory and its employees for this superb solidarity action that will help to soften the stay of these young patients. The Paint a Smile Team is back again! A second Paint a Smile project is underway in the Vanilla department, which welcomes children aged 0 to 6 years. During the 2017 “Course de l'Escalade”, the Colour Team raised CHF 9,005.00! A big thank you to all participants. This money will help finance a project in Geneva. The brushes are out; the paint is being prepared! A team of four artists will decorate the walls of a 53-meter corridor linking the Lagnon and Lanance buildings from January 30 to February 15. The design of this project is in the process of being finalised. The decor is full of tenderness and humour, in which paintings and decorative adhesives will brighten the walls and ceilings of this unit. 12th edition of the Couleurs Team! Register for the 2017 Course de l’Escalade at www.escalade.ch, and join the Colours Team to support a Paint a Smile project! > Registration form here. Once you have received confirmation of your registration, please send us the application form below. For all walkers, an information note about departure and arrival meeting points will be sent to you by November 13th. Paint a Smile takes pleasure in decorating the outpatient Oncology Unit of the Queen Fabiola Children's University Hospital (HUDERF). A beautiful universe comes alive under the brushes of the artist painters to everyone’s delight. Bike-IT is a united sporting achievement organized by Cargill International SA: 10 hours to cover 1650km on training bikes and 60 participants for this mad race. We extend our heartiest thanks to Mélanie Halff, Stuart Barber, Jonathan Cook and Sylvain Pralon, the Bike-IT organizers. This great energy helped raise the sum of CHF 3'000,- in favour of the Paint a Smile foundation. At Credit Suisse Geneva a lovely story is unfolding in favour of Paint a Smile. As part of an exhibition that is dedicated to them, Caran d'Ache is making fine art materials available for the decoration of Christmas balls. For each ball decorated, Credit Suisse is contributing the sum of CHF 1 to the Foundation. Come one and all to participate in the workshop and the collective work "Swiss tree @ 2 place Bel Air", located in the heart of the main hall of the building. This animation takes place until Saturday, January 14, 2017. Thanks to Crédit Suisse and Caran d'Ache for this wonderful support! > Watch the video of the event ! The 11th edition of the Colours Team! More than 350 runners and walkers joined the Colours Team in the “Course de l’escalade” to support Paint a Smile projects. A huge thanks to all these athletes – both the little ones and the grown-ups! Our Smile Team welcomed walkers at the Eden School and runners at the Café Restaurant of the Parc des Bastions, our partners of this solidarity event. Thank you to the many participants at the Gavroche Ballons stand, who discovered a "Fantastic World", inhabited by equally fantastic characters and animals. Paint a Smile was showcased thanks to the "one balloon = one gift" campaign in favour of Paint a Smile! We were able to raise 3'253 CHF! Many thanks for the generosity and support of Gavroche Ballons. A big bravo for their talent - a simply brilliant team! Thank you Anouk Burdet, thank you Zazou Desiles, thank you Luce for these hundreds of inflated and sculpted balloons! For the past two weeks, the artist painters have filled the corridors of the Margency Children's Hospital. Photos of the inauguration are coming soon! The painting project is complete and was inaugurated on Friday, August 12, 2016! The consultation as well as the hospitalisation departments were painted. The theme "Children of the World" now adorns the corridors. It was selected by the hospital to reflect all the nationalities present in Kiel, so that children can return to a familiar landscape or aspect of their culture. The paint artists have now headed to new pictorial adventures. You can find photos of inpatient and ambulatory emergency departments here and the outpatient department here. And of course don't hesitate to check out our FB page! Paint a Smile provided a framework for three kindergarten and primary school classes to produce a mural measuring 7 metres on the theme of Pop Art. The painting will be displayed in the school as a remembrance of this event. A "Photo booth" workshop was also proposed. Giant brushes, wigs and various accessories were available allowing for unlimited playful variations of poses and smiles. Photos printed on the spot were offered to the children. It was a wonderful day! Thank you for the welcome, and congratulations to the children for their creativity! Paint a Smile's very first project in Germany! Our team is now brainstorming at the Kiel's Städtisches Krankenhaus! Our best wishes to them! Das erste “Paint a Smile” Projekt in Deutschland hat begonnen! Unser Team ist im Städtischen Krankenhaus Kiel beim “Brainstorming” und anscheinend munter dabei! Schiff ahoi ! We'll be there from April 22 to 24! Come one and all to participate in our animation "Smile Painting". Visit us at booth 8002 - Hall 7 at Palexpo Genève. You will also have a unique opportunity to discover one of the iconic vending machinges kindly lent by our partner Caran D'Ache. The pediatric ENT unit is a new world, made of five corridor continents, five creations, each with their own colourful climate and atmosphere, a huge adventure playground for the tour of the now famous musical group "The Glottes Trotters". The completion of this beautiful project will soon be unveiled. It can be discovered here! 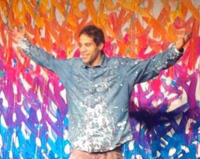 The work carried out by JonOne at the launch of Chromatic PPG Industries' colour chart and offered to the Paint a Smile Foundation will be auctioned by ARTCURIAL on Sunday, February 14, 2016 at 16h. The proceeds from this sale will help finance the design project for the Children's Hospital of the French Red Cross in Margency. 5 weeks of painting have begun! Our painters are now embellishing the ENT unit of the Necker Hospital for the delight of families and staff. and win one of 5 prizes offered by Caran D'Ache, our colour partner. Painting workshops for children in the presence of a professional artist will also take place on weekends and Wednesday, from 12:00 – 17:00. 10th Edition of the "Colours Team "
Over the past 10 years, “The Colours Team” has participated annually in the “Escalade” race to support the realisation of our projects. “The Colours Team” includes over 200 participants in corporate teams, or with friends and families. > Registration for the Colours Team CHF 35.- (in addition to the official registration for the race), students CHF 20.- before 10 November. > Our Smile Team will welcome participants in the warm Restaurant of the Parc des Bastions, where a booth, drinks, snacks and a table for each team of participants will be at their disposal. > Children will be welcomed to a table for games and activities throughout the day. > Participants and their personal belongings will be transported to Veyrier by minibus, for the Friday evening walk. > A welcome team with hot drinks and vitamins will be found 200m from the start. The prototypes are complete, Rendezvous September 15th to create the decor. First step, the 4th floor of Building 4D of the EMS Val Fleuri! And here we go for a fortnight of work in one of the units of the Renée Delafontaine Foundation, which welcomes daily 24 children with multiple disabilities, aged between 7-18 years. A big thank you to the Domaine Impérial Golf Club team in Gland "members4members/charity", which organised a competition on 20 June to raise the funds required to achieve this project. After 9 weeks of work, the team wrapped up its paintbrushes. A big thank you to Laetitia, the Godmother of the project and representative of the association “les Ptits Courageux” (the Courageous Little Ones). Inauguration of the new decoration in the presence of Myrtille, Godmother of the Project, SC JOHNSON and Professor Damien Bonnet, chief of the paediatric cardiology department. After 14 weeks of work, the team has put away its paintbrushes, leaving behind a magnificent decoration. "Thanks to this great team that beautifies a sad world. They give courage and joy to everyone." Angele, mother of a child in the cardiology unit of the hospital. Yannick, father of a child in the resuscitation unit. And here we go for 4 weeks of work with a team of 6 artist painters to decorate the resuscitation sector of the paediatric cardiology unit. To explore the first phase achieved in autumn 2014, click here! A three-week project with a team of six painters, it was realised mainly during the Christmas holidays to begin a colourful New Year! Discover the project in images here! A beautiful rejuvenation programme with 25 energised walkers, 120 highly motivated children and 80 exhilarated runners – topped off once again with an exceptional staff!!! "What nice energy circulated in the Colours Team that first Saturday of December in Geneva!